Anontex Group is one of the leading group of company in Bangladesh. 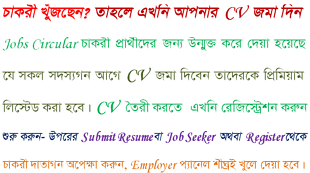 Anontex Group has invited a job circular are many posts. Applicant should have qualification in Masters/MBA in HRM. Birshreshtha Munshi Abdur Rouf College has been published a recruitment circular. Available jobs in Birshreshtha Munshi Abdur Rouf College. Educated and interested candidates can online apply.